Welcome to our page of English Byzantine Chant! Please check back as we will be continually updating this site with new music as it is composed or notated. Recordings of hymns and services along with material for learning Byzantine Notation will also be uploaded. 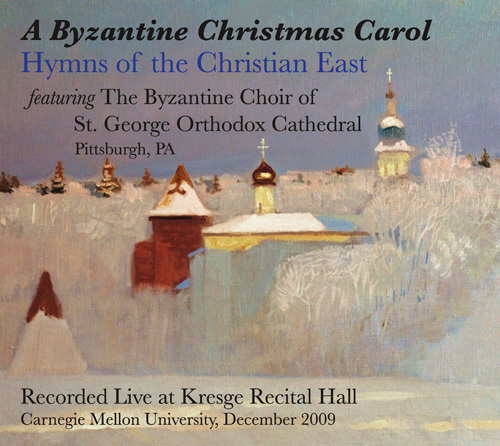 Check out our NEW CD, Great and Holy Pascha along with our first CD, A Byzantine Christmas Carol: Hymns from the Christian East! Please note that if you are viewing this website with Internet Explorer it will not look correct. At the moment, it is optimized for viewing with Firefox and Google Chrome. We have live lessons in Pittsburgh, PA and the DC metropolitan area. Please e-mail webmaster@byzantinechant.org for more information! Subscribe to the ByzantineChant.Org Distribution List for updates! February 3, 2017 - Added a recording for the Sunday of the Publican and Pharisee, added the Prosomia for St. Symeon (April 27), added OCA Hymns for Holy Thursday Evening (Dismissal Hymn and more Antiphons), added the first Doxasticon for Sts. Guria, Shamuna, and Habib, Sunday before the Nativity of Christ Aposticha Doxasticon, added some Litya verses for the Sunday of the Myrrhbearers, added the full Vespers Service for Sunday Evening of the Myrrhbearers, added some Tone 2 Hymns of Compunction for Sunday/Monday and the Sunday Martyrikon (from the Octoechos). September 19, 2015 - Added hymns for St. Eustathios (9/20), St. Thekla (9/24), and St. Panteleimon (7/27) under the Hymnology section. April 9, 2015 - Added Antiphons 7 and 8 to the OCA Holy Thursday Evening Antiphons; updated the Holy Unction canon with a cleaner copy. April 5, 2015 - Updated the Antiochian Holy Week Scores with some cleaner music; updated the Holy Thursday Antiphons (now including #15); added the brief "Christ is Risen" according to the OCA text; updated the Paschal Canon to include type-set Odes 1 and 3. March 14, 2015 - Uploaded the Sunday Evening Stichera of Repentance in the Grave Tone and the Prosomoia for March 16. March 3, 2015 - Finished the Stichera of the 2nd Wednesday of Great Lent; uploaded the Pl. 1 Stichera of Repentance and the Stichera for the 1st Sunday evening of Great Lent. February 15, 2015 - Uploaded the Jan. 18 Glory, Hymns for January 2 and the Sunday before Theophany, and the Kontakia for 10/30, 11/6, 12/11, and 12/16. February 14, 2015 - Uploaded the Glory for the Vespers of Meatfare Sunday. January 10, 2015 - Uploaded the Prosomoia for January 11 (St. Theodosius the Cenobiarch). April 14, 2014 - Uploaded the Troparion of Lenten 6th Hour. April 13, 2014 - Uploaded "Behold, the bridegroom" (Alleluiarion), "Thy Bridal Chamber" (Exapostilarion), and Holy Thursday Antiphon 6 from the OCA text for Holy Week. April 5, 2014 - Uploaded the Doxastica for the 5th Sunday of Great Lent (St. Mary of Egypt), and Antiphons 4, 5, and part of 6 for Holy Thursday Evening (OCA Translation). April 4, 2014 - Uploaded the Doxasticon at "Lord, I have cried" for the 3rd Sunday of Great Lent (to complete the Vesperal set). March 30, 2014 - Uploaded the 3rd Prosomoia (un-metered) for the 5th Wednesday Evening Vespers of Great Lent. March 3, 2014 - Added Troparia for the Lenten Hours (1st and 3rd, only); updated the Byzantine Notation Manual in English. December 6, 2013 - Added the Idiomela for the 1st and 3rd Royal Hours, and the Glory for the 6th Royal Hour of the Nativity of Christ; added a provisional, incomplete English adaptation of the Byzantine Notation Manual. August 30, 2013 - Added the Prosomoia for St. Symeon (September 1st). August 17, 2013 - Added two hymns for the Litya of the Dormition of the Theotokos (also used for the Sunday after Dormition). August 16, 2013 - Added music for: the Evlogitaria of the Theotokos, a St. Stephen Doxasticon (12/27), a Triple Meter Doxology, a Simplified Korean "Lord, have mercy" set, a Korean "Glory to Thee, our God, glory to Thee!" for Weddings, Holy Thursday Antiphons 1-3 using the OCA text, the Paschal Doxasticon using the OCA text, updated the Holy Saturday Canon (specifically Ode 6), Vespers hymns for the 3rd Tuesday of the Great Fast (Monday Evening), Simple Akathist Hymn refrains, and Refrains for the Canon of the Akathist. 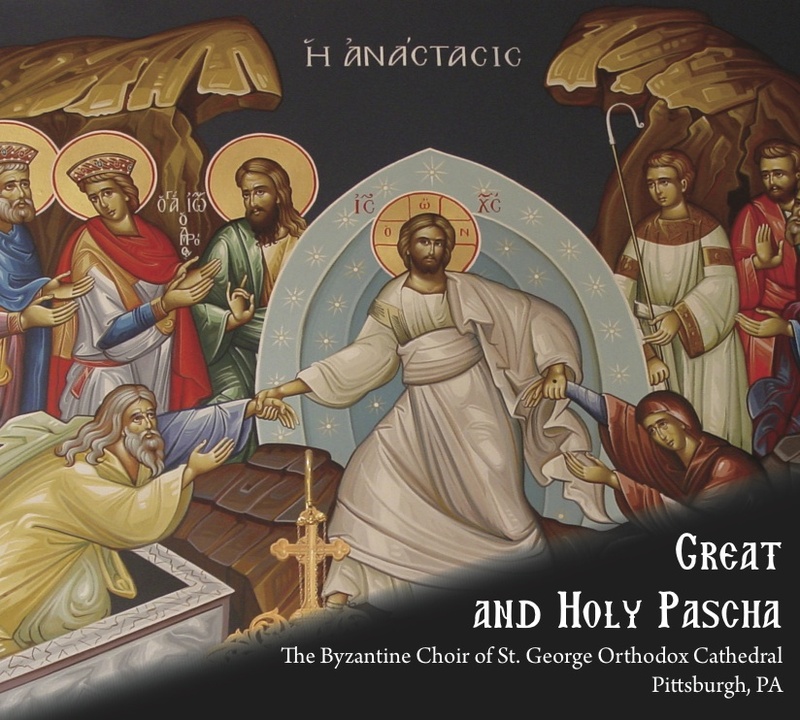 April 14, 2013 - Added Liturgica.com to our list of CD sellers for "Great and Holy Pascha"; updated the Streaming Videos with our YouTube playlist. September 22, 2012 - Put up the full recording of Matins and Liturgy from 9/16/2012 chanted with the St. Romanos Choir (Beirut, Lebanon), featuring a concert by their choir at the end. September 9, 2012 - Put up recordings with the words for the Brief Tone 1 Resurrectional Stichera. September 2, 2012 - Put up Parallege recordings for Tone Plagal 4, Brief Stichera of Vespers. July 19, 2012 - Put up the "Lord, I have cried" Glory for St. Mary Magdalene (July 22). June 15, 2012 - Put up Exercise 2 and Note Names Exercises under Learn/Byzantine Notation; added another link. April 28, 2012 - Put up the Sunday of the Myrrhbearers Aposticha Doxasticon; added more links on the link section. April 13, 2012 - Added the Exapostaleirion of Pascha and "Come, Receive the Light". April 6, 2012 - Updated the Matins of Lazarus Saturday with more music and changed music; added Holy Saturday Morning, and some parts to the Holy Week services where we used music from St. Gregory Palamas Monastery. March 25, 2012 - Added the Pl. 4 Mode Martyrikon for Wednesday Vespers (also added it to the 5th Wednesday of Great Lent). March 3, 2012 - Updated the Byzantine Notation Symbols Cheat Sheet and added Exercise 1, under Learn/Byzantine Notation. February 25, 2012 - Added the Paschal Canon (w/Katavasias) to the Hymnography section, and "The Paradise of Eden" to the Automela section. February 14, 2012 - Finished the Parallege for Tone 1, and added a distribution list. February 9, 2012 - Added a lot of Lenten Triodion music, and updated the hymnography section; added a link to our youtube channel (see above). February 3, 2012 - Added the hymns of Vespers for the Sunday of the Publican and Pharisee. February 1, 2012 - Added parts of the 9th Ode of the Canon for the Presentation of Christ, with a recording of it being sung by our choir. January 3, 2012 - Added the rest of the Slow Tone 1 Stichera of "Lord, I have cried"; added an adaptation of the Simona Petras Tone 1 "O Lord, I have cried" for the "O Strange Wonder" prosomoia. December 30, 2011 - Added some Slow Tone 1 Stichera under "Learn the Tones", and adjusted the "About" and "Discography" pages. December 4, 2011 - Added Prosomoia for St. John of Damascus, two Doxastica for St. John Chrysostom, and a Doxasticon for the Forefeast of the Entrance of the Theotokos under "Music/Orthodox Christian Hymnography". Added three Automela under "Music/Automela" - When he took Thee (Slow), What shall we now call you (Balamand), Rejoice (Oakmont). October 28, 2011 - Added the Tone 1 Brief Aposticha using note names under "Learn the Tones". October 21, 2011 - Updated the "Learning the Tones" and added a "Glossary" page under "Learn". October 20, 2011 - Added a new section on learning the tones under "Learn", including sound recordings using the note names for the Tone 1 Brief Stichera from St. Anthony's Monastery; also added two links for learning the tones under "Links". October 19, 2011 - Added Lesson 4 of the Streaming Lessons under "Learn/Streaming Lessons". October 16, 2011 - Added a hard-back text of "Great Theory of Music" by Chrysanthos of Madytos under "Learn/Resources". October 11, 2011 - Added "BYZANTINE MUSIC in Theory and Practice", a textbook by Prof. Savas I. Savas under "Learn/Resources". October 5, 2011 - Added the Apolytikion for the Myrrh-Streaming Iveron Icon of Hawaii. September 23, 2011 - Added a "Resources" section under "Learn" for written texts and textbooks in English. September 18, 2011 - Added an English version of the Scale Diagram under "Learn", "Byzantine Notation". September 12, 2011 - Updated "Hymns" section adding to the Menaion hymns and correcting September 8. July 10, 2011 - Updated the Table of Byzantine Notation Symbols. June 18, 2011 - Added the first "Glory" of Vespers for All Saints. June 12, 2011 - Updated the updates...much music has been added to the hymnology section, including much of Holy week and some of the Pentecostarion. The "Learn" link has been reformatted to include a section for short tutorials, and longer streaming/archived chant lessons. February 22, 2011 - Added the audio for the Hymn of Kassiane to the "Videos" section, which will go with Part 7 of the Hymnology Lecture. February 21, 2011 - Added four videos from Liturgy in Butler, PA with Fr. Bogdan Bucur (under "Videos"), and added an adaptation of the Beatitudes under "Orthodox Hymnography". January 6, 2011 - Added Tutorial 2 to the Byzantine Notation section under "Learn". December 14, 2010 - Added the Wedding of Jon and Kate Skowron to the recordings section! December 6, 2010 - Added Ison to the Scales section for the Diatonic Scale, and expanded the scale. December 2, 2010 - Added Tutorial 1 to the Byzantine Notation section under "Learn". November 7, 2010 - Added the Katavasias of the 1st Canon of the Nativity of Christ to the Hymnology section (as featured on our CD, A Byzantine Christmas Carol). October 15, 2010 - Added Part 4, 5, and 6 to the Hymnology lecture under Videos. October 15, 2010 - Added Part 2 and 3 to the Hymnology lecture under Videos, and added the SMI 2010 Concert and Great Vespers to the Recording section. September 22, 2010 - Updated Discography page, including all internet purchasing availability, and added Part 1 of the SMI 2010 Hymnology lecture to the Video section. September 4, 2010 - Updated Discography page adding a sample track, added "A Byzantine Christmas Carol" to the Video section, and updated the Index. September 3, 2010 - Scales and Discography page added (rough versions). August 3, 2010 - Holy Week Music taken down, in preparation for the most up-to-date, corrected versions. February 26, 2010 - Uploaded an updated version of the Canon of the Akathist (v1.1). February 19, 2010 - Added the Canon of the Akathist in the Hymns Section (v1.0). January 24, 2010 - Added Vespers Verses and Stichera, and some hymns from the Menaion. November 15, 2009 - Uploaded a recording for "O Strange Wonder" Plagal Fourth Mode - Oakmont Version. November 13, 2009 - Changed the Prosomoia page to the Automela page, and corrected Automela/Prosomoia word usage. Novermber 12, 2009 - Changed the mp3 play bars on the Prosomoia page to be flash and added a download link. November 11, 2009 - Uploaded two recordings to the Prosomoia page - "As one valiant" and "Unto them that fear Thee"!